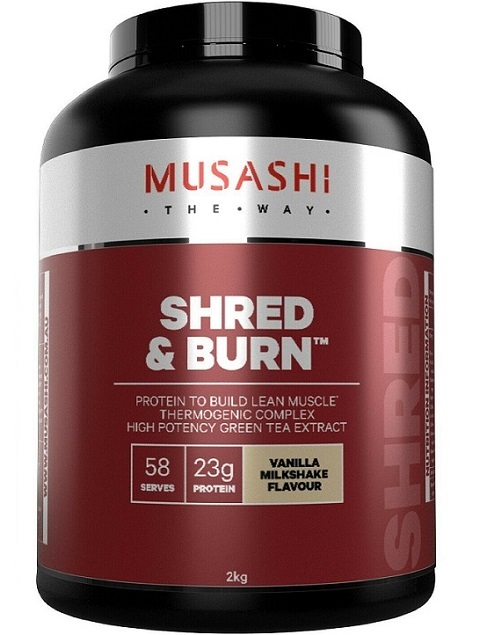 Musashi Shred and Burn delivers a thermogenic protein designed not onlly to increase your fat-burning potential but also to inhibit fat production. Shred and Burn protein contains effective ingredient dosages with each serve delivering Green Tea, Green Coffee and 100mg of Caffeine. The therapeutic dosed ingredinets in Musashi Shred and Burn work synergistically to inhibit both fat production and carbohydrate absorption, increase thermogensis (burning of calories through heat energy), and thus metabolic rate whilst boosting energy levels. Shred and Burn combines these fat-burning powerhouses with 22g protein per serve to help keep you satiated, balance blood sugar levels and most importantly aid the production of lean muscle mass for a toned, shredded physique. Musashi Shred and Burn provides proven ingredients, supported by science to help you effectively burn fat and acheive your weight loss goals. Mix 34g of Shred and Burn with 200ml water. Consume a maximum of one serve per day. INGREDIENTS: Musashi Shred and Burn Protein Blend (93%)[Whey Protein Concentrate, Whole Milk Powder, Whey Protein Isolate, Emulsifiers (Soy Lecithin, Sunflower Lecithin)], Cocoa Powder, Flavour, Vegetable Gum (Guar Gum), Sweetener (Sucralose), Caffeine, L-Carnitine, Enzyme (Papain), Green Tea Extract, Green Coffee Extract, Choline Bitartrate. Contains Lactose. Contains Caffeine. Use Only as Directed.